The ionosphere is the part of the atmosphere that contains ionized gaz, called plasma, and that affects radio propagation. It corresponds to altitudes from 50 to 500 miles at which the atmosphere is so thin that free electrons can exist. The ionization process originates from UV solar radiation and X-Ray wavelengths. These photons are energetic enough to dislodge electrons from gaz atoms. Simulatenously, those free electrons can be captured by positive ions. This is called recombination. The ratio between ionization and recombination determines on overall electron density. It depends on gaz density (at lower altitudes, the recombination process accelerates) and on the amount of radiation received from space (Sun mainly, but also GRBs). Thus, the ionosphere exhibits is a diurnal effect (day/night), a seasonal effect (summer/winter) and strong relationship with solar activity (11-years sunspot level and solar flares). The D layer is the closest to Earth surface. Its altitude ranges from 30 to 60 miles (50 km to 90 km). Due to the high density, recombination is important. The overall electron density is very low. This layer is mainly present in the daytime, but during the night, cosmic rays produce a residual amount of ionization. It does not reflects HF radio waves but is mainly responsible for their absorption, particularly at lower frequencies. Consequently, the absorption is smaller at nightime than at midday. One can notice that the AM radio stations are best received during the daytime. The E layer is higher in altitude, from 60 to 90 miles (90 km to 120 km). It only reflects radio waves with a frequency lower than 10 MHz and partially absorbs higher frequencies. The F layer ranges from 90 to 250 miles (120 km to 400km) above the Earth surface. It is responsible for most of skywave radio propagation. During the day, it divides into two layers, called F1 and F2. For our purpose, the D layer is of significant importance since solar flares and GRBs penetrate this ionospheric region. The monitoring the signal strength of a distant VLF transmitter allows to record SIDs related to solar flare or GRB events. In the daytime, the VLF wavelenghts are so long that the radio waves are conducted in the Earth-ionosphere waveguide (EIWG) between the Earth's surface and the ionosphere D-layer. The propagation is very stable and the signal attenuation is low. Uncommon variations are used to observe the way the ionosphere has been affected by X-rays flares from the sun. At night, the D-layer disappears and the waves are reflected by the higher E and F layers. The reflection coefficient is higher, thus leading to increased signal strengths at nighttime, but propagation is strongly affected by ionosphere characteristics, leading to significant signal variations that prevent monitoring SIDs. 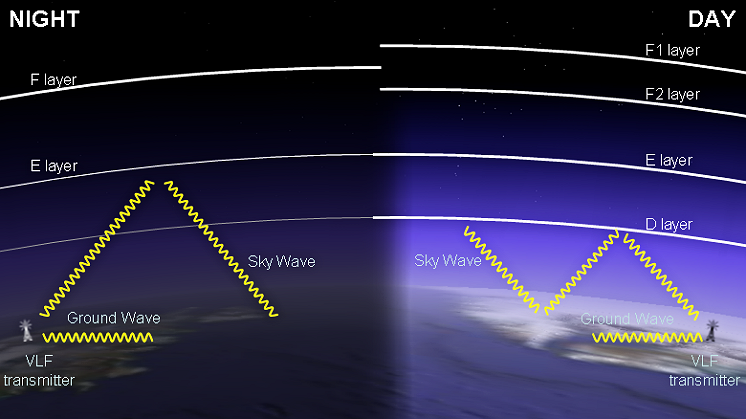 The sunrise and sunset patterns observed when recording signal strength correspond to the transition betwen the nighttime reflection of the signal at high altitudes and the daytime waveguide propagation mode. A Sudden Ionospheric Disturbance results from an increased ionization density in the D layer caused by a solar flare or possibly by a GRB. During a solar flare, the sunlit side of the Earth is hit by hard X-rays and UV radiation. They will penetrate to the D-layer and increase the ionisation process and the electron density. This will increase radio-wave absorption, especially in the upper MF (300kHz - 3 MHz) and lower HF (3MHz - 30 MHz) ranges, causing a radio blackout. For VLF (3 kHz - 30 kHz), the reflection coefficient increases, leading to a stronger skywave. Due to interferences between ground (direct propagation) and sky waves (reflected by the D-layer), the signal strength can increase or decrease during an event. As soon as the event ends, the SID and radio black-out end as the electrons in the D-layer recombine and signal strengths return to normal. The ionosation and recombination process are not instantaneous. Consequently, the disturbance will be detected with a slight delay with respect to the arrival of the X-ray photons (as measured by satellites such as GOES) and will last after the end of the flare. A significant number of elements influence the amount of the lag: the intensity and the shape of the X-ray flux, the initial ionisation level... Nevertheless, the delay is usually between 1 and 5 minutes after the start of the flare. And the disturbance can last for an hour or more after the end of the flare. To summarize, when a Solar Flare occurs, the VLF propagation is disturbed and it is possible to detect the SIDs by monitoring the variations or the signal level of a distant VLF receiver.